Well, this will be my last Trench Warfare post this year as well as before the game. I’ve learned a lot about what Georgia likes to do, and what they actually do. I’ll have a post up later today for my thoughts on the game tomorrow. In Short…Georgia is a really, really good team. While the average fan calls them boring, limited or pedestrian, simply put they do the common things uncommonly well. On the flip side of the that, if you aren’t fundamentally sound against them, they’re going to beat you. You have to maintain the proper angles, you have to tackle, and you have to pick up their blitz. All of this is fundamental, cerebral preparation. Word coming out of Pasadena from the Sooners camp is that the players believe this is the most prepared they’ve been leading up to a game this year. 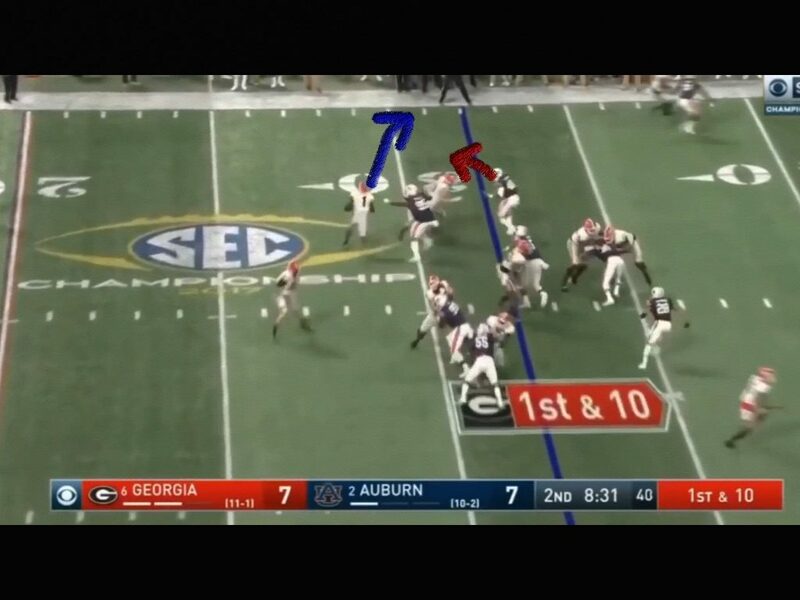 Below, the red arrow linebacker has to maintain outside leverage. He has to keep his outside arm(right arm) free to prevent the Georgia runner to get outside the numbers. If he does that, then the inside pursuit from his defensive lineman will catch up, and it’s a play for no gain. 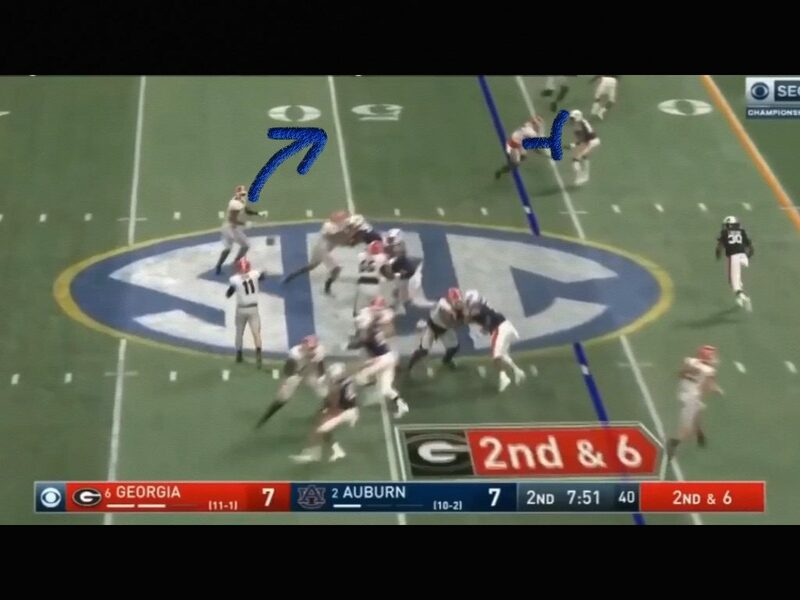 But the Auburn linebacker loses contain to the outside, and a simple swing pass turns into a big play. 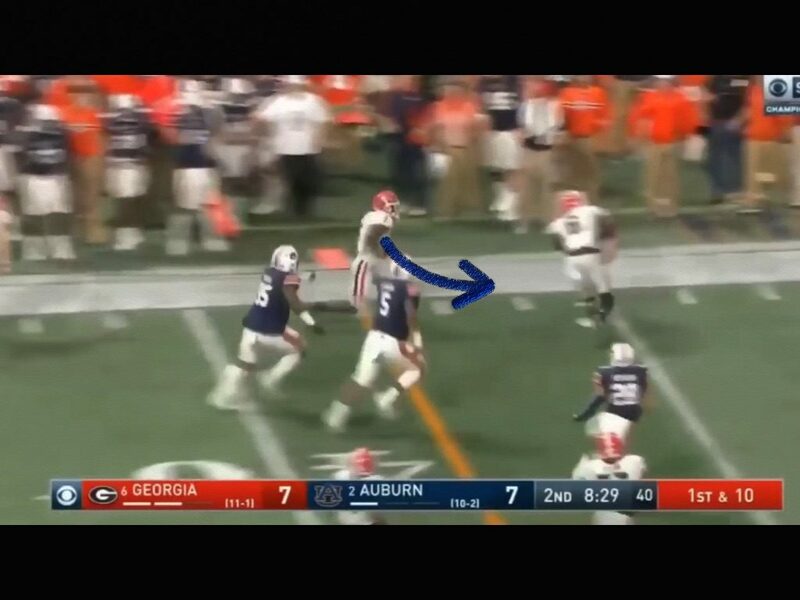 The defensive lineman who was pursuing is the far left player in this shot for Auburn. 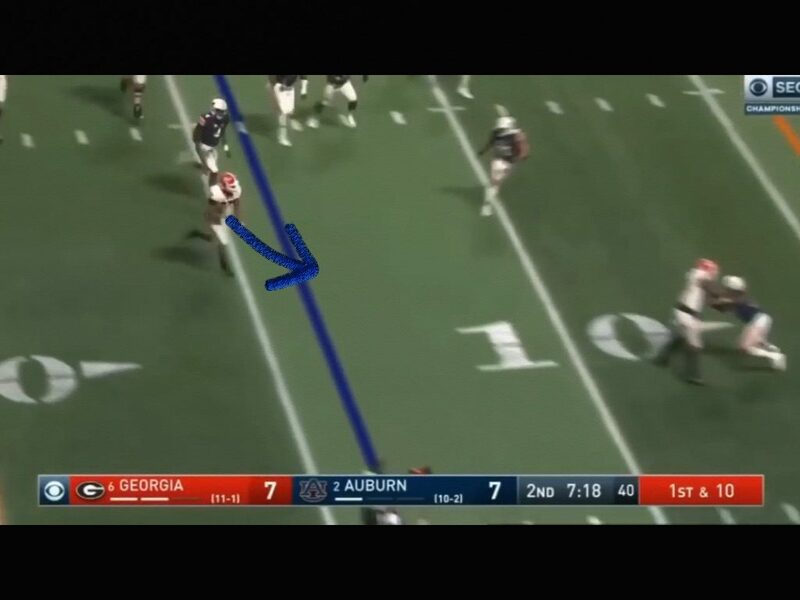 Considering how well he runs, the team defense of keeping him inside had it been done properly would have netted a big hit or a shutdown type play. On this drive, it was a lot of swing pass left and right. Georgia was having trouble protecting early and adapted. That’s the sign of good coaching. They couldn’t protect 5 or 7 step drop so they started going to quick throws like this. 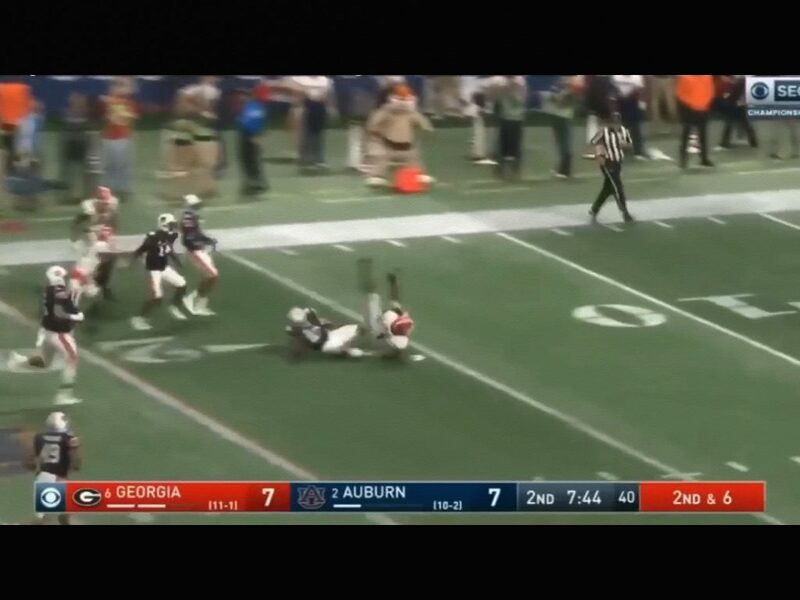 #30 for Auburn to the far right of the SEC logo in the middle of the field has to get on his horse and get outside. 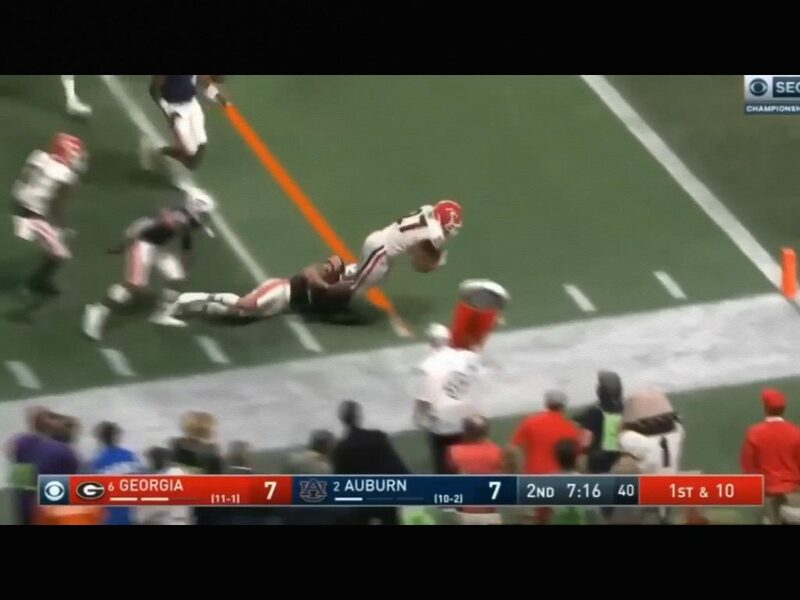 Both the DB and the linebacker can’t bring down Sony Michel, the GA running back, for again what should have been a play for no gain. Again Georgia does common things uncommonly well. As they started taking over this game, they broke the tackles that Auburn should have made. Simply put, they just beat them. While what they do isn’t complicated, they trust that their talent is going to beat yours. They’re going to put you in isolation situations with their athletes and trust their athletes to make a play. Once again what should have been a tackle for no gain or a loss, turns into a big play. It’s a 30 or so yard gain on a simple swing pass. The Sooners absolutely are going to have to beat blocks and TACKLE to win this game. 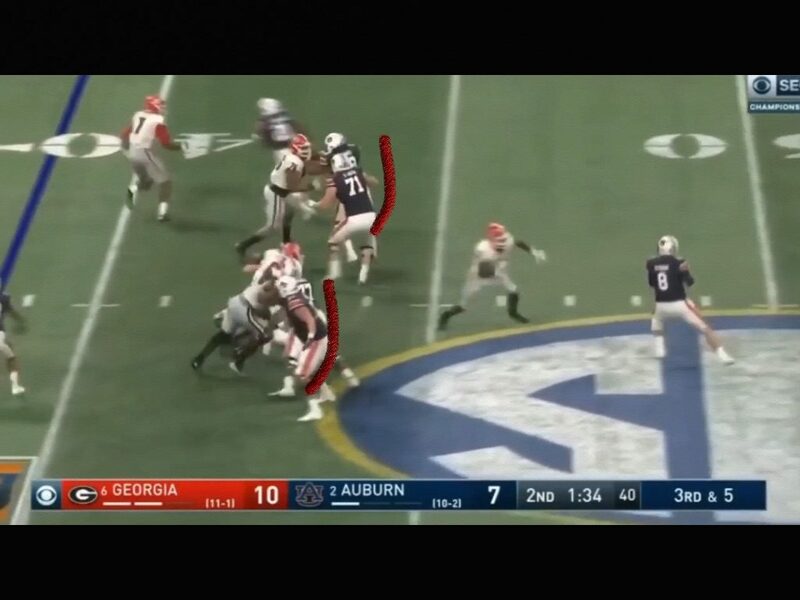 Then they switch off to Nick Chubb on swing pass right. 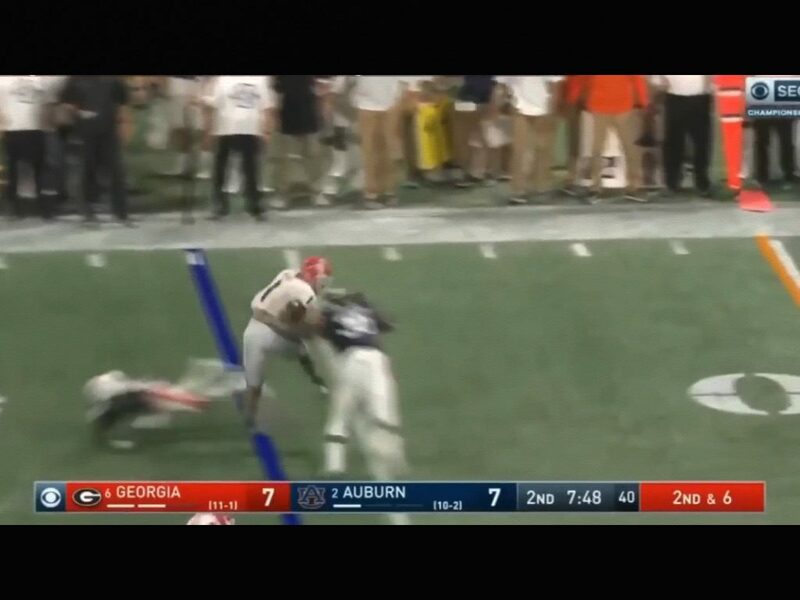 The Georgia receivers do a really good job blocking. While swing passes are simple, getting a good running back in the open behind good blocking receivers is where you want to be. Most of the time your backs will fall forward and help you move the chains. And that’s exactly what he does. The only saving grace for the Sooners with these types of plays is that in the Big XII they see this type of thing a lot more than folks in other conferences do. They defended J.K. Dobbins for Ohio State really well in the swing pass game so much that the Buckeyes just stopped doing it. They’ll need to do that again tomorrow. 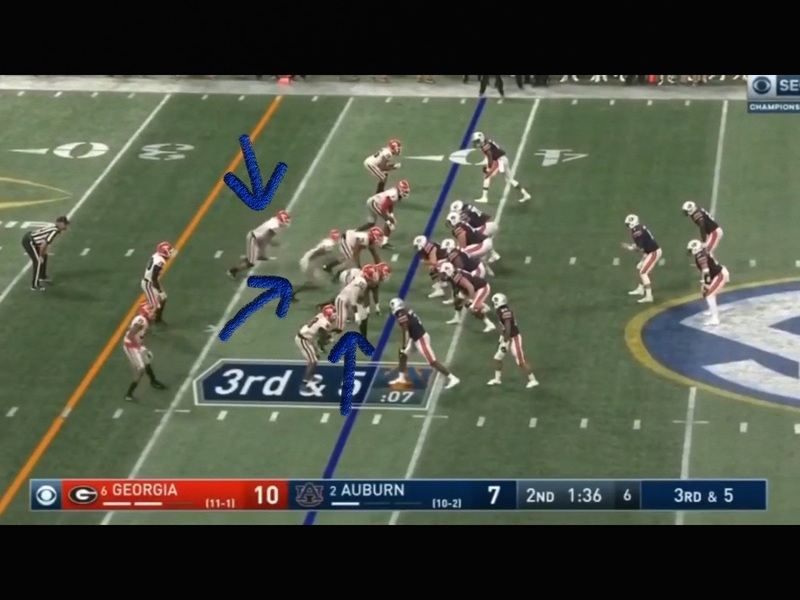 Defensively, Georgia continues in every game to show their hand on the blitz. I’m a believer in Coach Bill Bedenbaugh and his ability to prepare an offensive line mentally to play nasty, academically in the film room, technically and fundamentally. 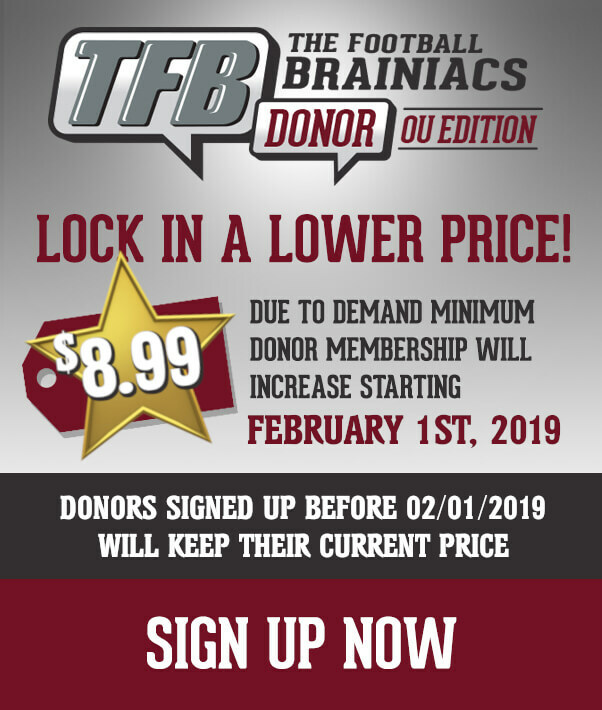 In years past I was concerned when the Sooners got in big Bowl games at the end of the year. With Coach B at the helm, I’m not anymore. But back to an earlier point, if the Bulldogs show their hand to Riley and Baker like this, they’ll get burned. If they’re smart they’ll stem a lot and give Baker a false read like Texas did. But even still I believe that Oklahoma’s offensive line will be the best that Georgia has seen this year. This is piss poor protection. #71 has to be see that linebacker blitzing pre-snap and be ready to pick him up. You have two guys blocking one and the linebacker comes free up the middle. That’s the absolute cardinal sin for offensive lineman. Two actually, don’t get beat up the middle and never get beat to the inside. Also, you have the tackle at the bottom not blocking anybody. The Sooners have handled blitzes like this regularly. 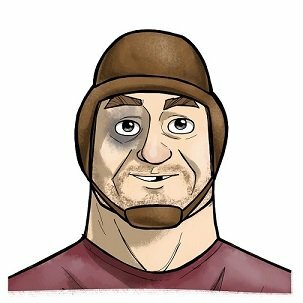 While I understand they haven’t seen Georgia’s fastball…a la Nuke LaLoosh…I hope those suckers throw it and watch Baker hit it out of the park.